ON 9 August 1974, Richard Nixon arose in the White House and, after meeting briefly with the household staff and his cabinet, took a helicopter from the lawn to Andrews Air Force Base, where he boarded a presidential plane for a trip with his family to the West Coast. But this trip was different from all others, for at exactly noon, while Nixon was flying over Jefferson City, Missouri, his chief of staff, Alexander Haig, delivered a letter to Secretary of State Henry Kissinger that read, "Dear Mr. Secretary: I hereby resign the Office of the President of the United States. 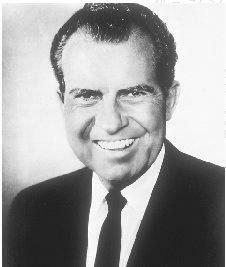 Sincerely, Richard Nixon." The thirty-seventh president of the United States had become the first in American history to resign the office in disgrace. The tragedy of the Nixon presidency lies not in its politics or policies, or even in its confrontation with Congress and the courts over the extension of presidential prerogatives, but rather in its use of unconstitutional, illegal, and illegitimate means to achieve its ends. Useful general biographies include Stephen E. Ambrose, Nixon , 3 vols. (New York, 1987–1991); Roger Morris, Richard Milhous Nixon: The Rise of an American Politician (New York, 1990); and Herbert S. Parmet, Richard Nixon and His America (Boston, 1990). Irwin F. Gellman, The Contender: Richard Nixon, the Congress Years, 1946–1952 (New York, 1999), offers an exhaustive account of Nixon's years in the legislature and his controversial election campaigns. Richard M. Nixon, R. N.: The Memoirs of Richard Nixon , 2 vols. (New York, 1978), is a sketchy, ambiguous, and incomplete defense of the Nixon presidency; and Leaders (New York, 1982), Nixon's reflections on conversations with world leaders such as Churchill and de Gaulle, gives some indication of his own style of leadership. William Safire, Before the Fall: An Inside View of the Pre-Watergate White House (Garden City, N.Y., 1975), discusses Nixon's foreign and domestic policies from the vantage point of a key speechwriter. John Ehrlichman, Witness to Power: The Nixon Years (New York, 1982), a gossipy account of the personalities in the Nixon White House, gives a good sense of the level of intellect of Nixon's key aides, as does H. R. Haldeman, with Joseph DiMona, The Ends of Power (New York, 1978). The Haldeman Diaries: Inside the Nixon White House, (New York, 1994), also available on CD-ROM, provides a day-by-day account of White House operations. Allen J. Matusow, Nixon's Economy: Booms, Busts, Dollars, and Votes (Lawrence, Kans., 1998), discusses the economic policies of the administration and links them to the 1972 election cycle. Henry Kissinger, The White House Years (Boston, 1979) and Years of Upheaval (Boston, 1982), give by far the best analysis of Nixon's statecraft, although they also constitute a defense of Kissinger's performance as a presidential assistant. Seymour M. Hersh, The Price of Power: Kissinger in the Nixon White House (New York, 1983), is an almost point-by-point refutation of Nixon's and Kissinger's memoirs based on interviews with hundreds of Nixon administration officials, designed to show the political and personal considerations that went into their foreign policy decisions. Larry Berman, No Peace, No Honor: Nixon, Kissinger, and Betrayal in Vietnam (New York, 2001), describes the ultimate consequences of Nixon's policies in Vietnam. William P. Bundy, a former Johnson administration official, offers his assessment of Nixon's foreign policy legacy in A Tangled Web: The Making of Foreign Policy in the Nixon Administration (New York, 1998). J. Anthony Lukas, Nightmare: The Underside of the Nixon Years (New York, 1976), exposes the dirty tricks of the Nixon presidency. Elizabeth Drew, Washington Journal: The Events of 1973–1974 (New York, 1975), is the most perceptive and readable of the Watergate narratives. The Presidential Transcripts (New York, 1974), transcripts of edited tapes released by the Nixon White House on 30 April 1974, provide conversations between Nixon and his key White House aides, as well as commentary putting them in perspective by the staff of the Washington Post . Arthur M. Schlesinger, Jr., The Imperial Presidency (Boston, 1973), attempts to place the Nixon and Johnson presidencies in the context of an emerging imperial presidency. Stanley Kutler, ed., Abuse of Power: The New Nixon Tapes (New York, 1997) provides transcripts of Nixon's White House tapes. James L. Sundquist, The Decline and Resurgence of Congress (Washington, D.C., 1981), is a study of presidential-congressional conflict during the Nixon administration and how many of these conflicts were resolved in succeeding administrations. Eleanora W. Schoenebaum, ed., Profiles of an Era: The Nixon-Ford Years (New York, 1979), is a reference work containing 450 biographies of key figures in the Nixon administration. See also Gerald S. Strober and Deborah H. Strober, Nixon: An Oral History of His Presidency (New York, 1994). Another useful effort to put Nixon in the context of political science theories of presidential power is contained in Michael A. Genovese, The Nixon Presidency: Power and Politics in Turbulent Times (New York, 1990). Recent works include Richard Reeves, President Nixon: Alone in the White House (New York, 2001), which draws on extensive archival research and interviews to produce a complex portrait of the complex president. Monica Crowley, Nixon Off the Record (New York, 1996) and Nixon in Winter (New York, 1998), provide a unique trove of Nixon's thoughts on a wide variety of political and personal subjects, written by a foreign policy research assistant of his during his final years. See also Anthony Summers, with Robbyn Swan, The Arrogance of Power: The Secret World of Richard Nixon (New York, 2000). wow. thats a ;lot of good info....it reallly helped!!! THNX!! He was a good and bad president, with Watergate and all, but he is portrayed as a bad president. who wrote this please give me an answer! This site will help me and my history essay if i know who written it? can i please have sources for this article? i am writing a hitosry research paper and i found some helpful information on this webstite, but i need reffrences inorder to back up my iformation..